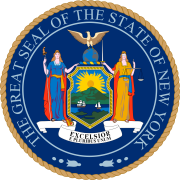 The 2018 New York gubernatorial election occurred on November 6, 2018. Incumbent Democratic Governor Andrew Cuomo won re-election to a third term, defeating Republican Marc Molinaro and several minor party candidates. Cuomo received 59.6% of the vote. Cuomo defeated actress and activist Cynthia Nixon in the Democratic gubernatorial primary. Cuomo's running mate, Lieutenant Governor Kathy Hochul, outpolled New York City Councillor Jumaane Williams in the Democratic primary. Democratic candidates Cuomo and Hochul also ran on the ballot lines of the Independence Party and the Women's Equality Party; after Nixon and Williams withdrew from the race in October, Cuomo and Hochul received the nomination of the Working Families Party as well. Dutchess County Executive and former New York State Assemblymember Marc Molinaro was the Republican, Conservative, and Reform Party candidate. Molinaro's running mate was former Rye City Councilmember Julie Killian. Third-party gubernatorial candidates appearing on the general election ballot included Howie Hawkins, repeat candidate for the Green Party; former Syracuse Mayor Stephanie Miner, running on the newly-created Serve America Movement line; and Larry Sharpe of the Libertarian Party, who was the runner-up in the 2016 Libertarian primary contest for Vice President of the United States. Incumbent Democratic governor Andrew Cuomo decided to seek re-election in 2014 to a second term in office. Governor Cuomo defeated Zephyr Teachout in a primary election, 63% to 33%, and went on to defeat the Republican nominee, Westchester County Executive Rob Astorino, 54% to 40%, in the general election. New York gubernatorial elections operate on a split primary system: governor and lieutenant governor candidates in each party run in separate primary elections. In the general election, candidates are chosen as unified governor/lieutenant governor tickets. New York allows electoral fusion, in which candidates may appear on multiple ballot lines in the same election. Candidates may count the votes they receive on all party lines toward their overall vote total, but only if the governor and lieutenant governor match on all of the parties. The results of the gubernatorial election also determine ballot access and ballot order. A party's gubernatorial candidate must receive 50,000 votes or more for that party to obtain automatic ballot status in New York for the following four years. The last Republican to win a gubernatorial election in New York was George Pataki in 2002. On November 15, 2016, incumbent Gov. Andrew Cuomo announced his intention to seek a third term in office. On May 23, 2018, incumbent governor Andrew Cuomo secured the nomination of the Democratic Party at the state convention after winning support from more than 95% of the state delegates. No other candidates qualified for the primary ballot at the convention, as they all failed to meet the required 25% delegate threshold. Actress and activist Cynthia Nixon sought to petition her way onto the Democratic primary ballot. By July 12, Nixon had obtained 65,000 petition signatures, which is more than four times the 15,000 required to force a primary election. Kathy Hochul defeated New York City Councillor Jumaane Williams in the Democratic primary. On May 23, 2018, the party unanimously nominated Marc Molinaro as its candidate for Governor of New York at its state convention. No challengers attempted to petition onto the primary ballot, so no Republican primary took place. Deputy Senate Majority Leader John A. DeFrancisco ran for the Republican nomination, but withdrew his candidacy on April 25, 2018, after party leaders--who had initially given him their support--threw their support to Molinaro instead. Conservative Party of New York State: On April 13, 2018, in what Party Chairman Michael R. Long termed a "not very easy" decision, the Conservative Party Executive Committee selected Marc Molinaro over Deputy Senate Majority Leader John A. DeFrancisco as its gubernatorial endorsee. Green Party of New York: On April 12, 2018, Howie Hawkins, after initially implying after the 2014 election that he would not seek the office again, launched his third consecutive campaign for the position, his 21st campaign for public office. Working Families Party: On April 14, 2018, by a 91–8 margin, the Working Families Party endorsed Cynthia Nixon as its gubernatorial candidate, with Jumaane Williams as her running mate. The endorsement came after the labor unions that formed part of Cuomo's political machine, who were able to force the party to nominate Cuomo instead of Zephyr Teachout in 2014, withdrew from the party, and Cuomo declined to seek the party's line. On September 13, 2018, after being defeated by Cuomo in the Democratic primary, Nixon declined to say whether she would continue to run for governor on the Working Families Party line. On October 3, the Working Families Party offered Cuomo and Hochul their party's ballot line. Cuomo and Hochul accepted that offer on October 5. Independence Party of New York: On December 23, 2017, the Party endorsed incumbent governor Andrew Cuomo for the third consecutive election cycle. Women's Equality Party: The party endorsed Cuomo for re-election, as the party remains allied with the Cuomo campaign. Reform Party of New York State: On May 19, after the party's executive committee deadlocked between Marc Molinaro and Joel Giambra in April, delegates at the Reform Party state convention nominated Republican frontrunner Molinaro as their candidate for governor. Any candidate not among the eight qualified New York political parties (Democratic, Republican, Conservative, Green, Working Families, Independence, Women's Equality and Reform, respectively) was required to submit petitions to gain ballot access. Such candidates did not face primary elections. Third parties whose respective gubernatorial candidates received at least 50,000 votes in the general election secured automatic ballot access in all state and federal elections through the 2022 elections. On July 12, 2017, Larry Sharpe, business consultant and runner-up in the 2016 Libertarian Party vice presidential primary, officially announced that he would run for Governor of New York in 2018. Sharpe was the first person to announce his candidacy to run against incumbent governor Andrew Cuomo. On August 19, 2018, the Libertarian Party announced it had collected over 30,000 signatures to place its ticket onto the November ballot. Sharpe's petitions survived a petition challenge. On June 18, 2018, former Syracuse Mayor Stephanie Miner, after expressing informal interest in the Working Families and Reform nominations, entered the gubernatorial race as a third-party candidate. Miner "plans to run under the banner of an upstart new group, the Serve America Movement, which calls itself SAM (coincidentally sharing Miner's initials), formed by people disaffected by the existing party structure after the 2016 elections. She will be the group’s first candidate." Miner circulated designating petitions to create a SAM Party in New York, and on August 21, her campaign announced that it had submitted over 40,000 petition signatures. Miner's submitted petitions far exceeded the 15,000 required to qualify for the November ballot. Persons tied to the Cuomo campaign, after reviewing the petitions, failed to find enough specific objections to challenge their validity. Jimmy McMillan, the party's founder and figurehead indicated on the party Web site that he would make another attempt at the office. He submitted petitions on August 21, 2018, with himself as the gubernatorial nominee and Christialle Felix as his running mate. When the ballot order was released, McMillan and the Rent Is Too Damn High Party had been disqualified and removed from the ballot. Jill Stein, physician, activist, former local politician, Green Party's presidential nominee in the 2012 and 2016 elections and candidate for governor of Massachusetts in 2002 and 2010. Howie Hawkins retained ballot access for the Green Party for four more years (albeit falling to Line E while the Working Families line rose to Line D). Stephanie Miner narrowly surpassed the 50,000-vote threshold to allow the Serve America Movement ballot access, on Line H.
The Libertarian Party of New York achieved ballot access with Larry Sharpe's 90,816 votes, the first time in the over 40-year history of the party that it has achieved the feat despite several previous efforts; Sharpe performed most strongly in the rural counties upstate, finishing with nearly 10% of the vote in Schuyler County and at or near 5% in most others. The Women's Equality Party and Reform Party of New York both lost automatic ballot access by failing to receive 50,000 votes for the candidates on their lines, respectively Cuomo and Molinaro. ^ d_evers (October 12, 2018). "Odd ballot lines flourish with New York's system of fusion voting". CSNY. ^ "Election Day 2018: Here's what's on the ballot in New York". Rochester Democrat and Chronicle. ^ Weiner, Mark (August 15, 2017). "George Pataki wasn't kidding: He endorses Kid Rock for Senate". Syracuse.com. Retrieved October 23, 2018. ^ a b Lovett, Kenneth (November 15, 2016). "Gov. Cuomo plans to seek reelection despite considered possible 2020 presidential candidate". New York Daily News. Retrieved November 15, 2016. ^ a b Lovett, Kenneth; Blain, Glenn; Fisher, Janon (May 23, 2018). "Gov. Cuomo overwhelmingly beats out Cynthia Nixon for Democratic Party nomination". New York Daily News. ^ Paiella, Gabriella (July 13, 2018). "Cynthia Nixon Got Over 65,000 Signatures to Appear on the Primary Ballot". The Cut. Retrieved July 24, 2018. ^ "Randy Credico Live On The Fly on Twitter". ^ Spector, Joseph (March 21, 2018). "Terry Gibson ends underdog bid after Cynthia Nixon enters governor race". Poughkeepsie Journal. Gannett News Service. Retrieved March 21, 2018. ^ Smith, Chris. "Preet Bharara Isn't Running for Anything". Retrieved May 22, 2018. ^ "Bob McCarthy: Chairman Brown is having fun". January 27, 2018. Retrieved May 22, 2018. ^ Churchill, Chris (January 7, 2017). "Churchill: Hillary for governor? Let the fun begin". Times Union. Retrieved January 7, 2017. ^ "Hillary Clinton says she will never run for public office again". The Los Angeles Times. April 7, 2017. Retrieved April 7, 2017. ^ a b "DiNapoli Files For 2018". www.nystateofpolitics.com. Retrieved March 19, 2018. ^ Jimmy Vielkind (September 2, 2016). "Gillibrand on being governor: 'No'". Politico. Retrieved September 22, 2016. ^ Lovett, Ken (July 31, 2017). "Cuomo faces possible 2018 challenge from Syracuse mayor". New York Daily News. Retrieved August 1, 2017. ^ Spector, Joseph (April 9, 2018). "Stephanie Miner: 'I'm seriously considering running for governor'". Democrat & Chronicle. Retrieved April 10, 2018. ^ "Teachout Official Twitter Account". March 19, 2018. Retrieved March 19, 2018. ^ Lovett, Kenneth (August 14, 2017). "Jumaane Williams eyed as possible 2018 Democratic challenger to Gov. Cuomo". New York Daily News. Retrieved August 14, 2017. ^ Harding, Robert (February 22, 2018). "Jumaane Williams aims to become 'people's lieutenant governor'". Retrieved February 23, 2018. ^ "Assemblyman Tom Abinanti endorses Cynthia Nixon". News 12 Westchester. August 10, 2018. ^ "This Democrat might be Cuomo's biggest challenger next year". July 27, 2017. Retrieved May 22, 2018. ^ Lovett, Kenneth (July 18, 2018). "EXCLUSIVE: Nixon picks up first endorsement from a state legislator — Assemblyman Andrew Hevesi". New York Daily News. ^ Mark-Viverito, Melissa (July 1, 2018). "Why I'm backing Cynthia Nixon: A dedicated & proven progressive for New York governor". New York Daily News. Retrieved July 2, 2018. ^ "Cynthia Nixon on Twitter". ^ "CARDIVENOM on Instagram: "Polls close around 8PM .NEW YORKERS VOTE NOW !!!!!! #cynthia #jumaane"". Instagram. ^ "Kristin Davis endorses Cynthia Nixon for governor". March 19, 2018. Retrieved May 22, 2018. ^ Sargent, Jordan (September 10, 2018). "Cynthia Nixon's Controversial Bagel Order Approved By Deli Connoisseur El-P". Spin. Retrieved September 14, 2018. ^ Feinberg, Ashley [@ashleyfeinberg] (September 9, 2018). "voting for cynthia nixon on thursday to own the libs except unironically" (Tweet). Retrieved September 14, 2018 – via Twitter. ^ Ferguson, Jesse Tyler [@jessetyler] (June 20, 2018). "Can't wait! Come hear why NYC needs @CynthiaNixon!" (Tweet). Retrieved June 22, 2018 – via Twitter. ^ @ShaunKing (March 20, 2018). "Shaun King on Twitter" (Tweet) – via Twitter. ^ Secular Talk (April 17, 2018). "Bernie-Style NY Governor Candidate Cynthia Nixon Gets Major Lefty Endorsement". Retrieved May 22, 2018 – via YouTube. ^ "Left-wing activist endorses Cynthia Nixon over Cuomo". April 9, 2018. Retrieved May 22, 2018. ^ "350 Action and Bill McKibben Endorse Cynthia Nixon for NY Governor". Common Dreams. ^ @Rosie (March 19, 2018). "ROSIE on Twitter" (Tweet) – via Twitter. ^ CNN, Lisa Respers France,. "Sarah Jessica Parker endorses Cynthia Nixon in bid for NY governor". Retrieved May 22, 2018. ^ "#Educators4Cynthia - Cynthia For New York". Retrieved May 22, 2018. ^ "Richard Schiff on Twitter". Twitter. August 12, 2018. ^ "Woman challenging veteran Brooklyn state senator looks to become the next Ocasio-Cortez". July 2, 2018. Retrieved July 2, 2018. ^ T.I. [@Tip] (September 10, 2018). "I have no idea who this brilliant lady is...But she's invited to my next bbq/family gathering and if she's running for anything...ANYTHING I SAY..She's got my vote!! !Right on to the Righteous Decent White People out there, using their privilege to make a difference!! !#USorELSE✊🏽" (Tweet). Retrieved September 14, 2018 – via Twitter. ^ @ZephyrTeachout (March 19, 2018). "Zephyr Teachout on Twitter" (Tweet) – via Twitter. ^ GOP War Room (March 21, 2018). "The Young Turks Calls Cuomo "Corrupt," Says "Wonderfully Progressive" Cynthia Nixon Can Win" – via YouTube. ^ Stallman, Richard. "Cynthia Nixon's politics". Richard Stallman's Personal Site. Retrieved September 28, 2018. ^ Stallman, Richard. "Wayback Machine - Richard Stallman's Personal Page". Wayback Machine - Richard Stallman's Personal Page. Archived from the original on September 5, 2018. Retrieved September 5, 2018. ^ "350 Action and Bill McKibben Endorse Cynthia Nixon for NY Governor". New York State of Politics. Retrieved June 8, 2018. ^ "Citizen Action Endorses Nixon For Governor". New York State of Politics. Retrieved April 15, 2018. ^ "Andrew Cuomo is a terrible Democrat—but we can replace him with a true progressive, Cynthia Nixon". Daily Kos. Retrieved May 3, 2018. ^ "Cynthia Nixon Receives Democracy for America Endorsement". The Advocate. Retrieved May 3, 2018. ^ "PCCC Endorses Nixon For Governor". www.nystateofpolitics.com. Retrieved June 8, 2018. ^ "Everyone Loves Cynthia Nixon, Including New York's Largest Immigrant Rights Group". Splinter News. Retrieved April 15, 2018. ^ Blain, Kenneth Lovett, Glenn. "Cynthia Nixon wins endorsement from progressive group Citizen Action for her campaign for governor - NY Daily News". Retrieved May 22, 2018. ^ "Cynthia Nixon". Our Revolution. Retrieved May 22, 2018. ^ "N.Y. gubernatorial challenger Cynthia Nixon gains backing of Bernie Sanders' progressive group Our Revolution". NY Daily News. Retrieved May 14, 2018. ^ Vielkind, Jimmy. "Working Families Party endorses Nixon over Cuomo". Politico. Retrieved April 14, 2018. ^ Grim, Ryan; Jilani, Zaid. "CYNTHIA NIXON AND FOUR OTHER PROGRESSIVES RECEIVE BACKING OF GROUP THAT HELPED PROPEL OCASIO-CORTEZ TO VICTORY". The Intercept. Retrieved July 17, 2018. ^ "Indivisible Brooklyn on Twitter". ^ Birnbaum, Emily. "New York chapter of Democratic Socialists of America endorses Cynthia Nixon". The Hill. Retrieved August 3, 2018. ^ Marans, Daniel. "Democratic Socialists Endorse Cynthia Nixon For Governor Of New York". The Huffington Post. Retrieved August 3, 2018. ^ Riley, John (August 29, 2018). "Trans United Fund endorses Cynthia Nixon for New York governor". Metro Weekly. ^ "Cynthia Nixon for Governor". The Nation. June 6, 2018. Retrieved June 6, 2018. ^ Bolger, Timothy (August 13, 2018). "Cuomo, Nixon To Debate at Hofstra University". Long Island News from the Long Island Press. Retrieved August 13, 2018. ^ Blain, Glenn. "Marcus Molinaro accepts New York GOP nomination for governor - NY Daily News". ^ Roy, Yancey (January 31, 2018). "Upstate senator jumps into governor's race: 'Enough is enough'". Newsday. Retrieved January 16, 2018. ^ robert.harding@lee.net, Robert Harding. "DeFrancisco, No. 2 in NY Senate, exploring run for governor in 2018". Retrieved May 22, 2018. ^ Weiner, Mark (January 29, 2018). "NY Sen. John DeFrancisco confirms he's running for governor". The Post-Standard. Retrieved January 30, 2018. ^ Lovett, Kenneth. "New York Republican gubernatorial candidate drops out of race, narrowing GOP options - NY Daily News". Retrieved May 22, 2018. ^ Robert Harding (May 24, 2018). "Joe Holland, NY attorney general candidate with Auburn ties, endorsed by 16 GOP chairs". AuburnPub.com. Retrieved May 24, 2018. ^ Joseph Spector (December 12, 2017). "Kolb becomes first Republican to officially announce run against Cuomo". Democrat and Chronicle. Retrieved February 12, 2018. ^ Klepper, David (February 9, 2018). "Kolb Drops Out of Governor's Race; Republican Field Now at 2". U.S. News and World Report. Retrieved February 10, 2018. ^ "After loss, Astorino rules out run for governor". lohud.com. November 9, 2017. ^ McCarthy, Robert (December 11, 2015). "Paladino considering a run for governor in 2018". The Buffalo News. Retrieved December 19, 2015. Republicans said to be considering a 2018 run include former Environmental Conservation Commissioner John P. Cahill, Rep. Chris Gibson of the Hudson Valley and Westchester County Executive Rob Astorino, who was the 2014 Republican candidate. ^ Alexander Burns (April 6, 2015). "Chris Gibson, an Upstate Republican, Starts Early on a Possible Run for Governor". WMUR. Retrieved December 13, 2015. ^ Yee, Vivian (May 2, 2016). "Chris Gibson, G.O.P. Congressman, Decides Not to Run for New York Governor in 2018". The New York Times. Retrieved May 24, 2016. ^ Robert J. McCarthy (December 12, 2015). "Paladino considering run for governor in 2018". WMUR. Retrieved December 12, 2015. ^ Smith, Emily (April 6, 2017). "Donald Trump Jr. talks about running for governor of New York". Page Six. Retrieved April 6, 2017. ^ Lemire, Jonathan (April 11, 2017). "Donald Trump Jr nixes 2018 NY bid, but maybe later". ABC News. Retrieved April 11, 2017. ^ Lovett, Ken (December 31, 2017). "Republican business whiz Harry Wilson won't run for New York governor in 2018". New York Daily News. ^ robert.harding@lee.net, Robert Harding. "Rep. John Katko endorses John DeFrancisco for NY governor". Retrieved May 22, 2018. ^ a b c d "Senators Akshar, Bonacic, Boyle, Croci and Gallivan Endorse John DeFrancisco for Governor". myemail.constantcontact.com. Retrieved May 22, 2018. ^ a b c d "Local senators endorse John DeFrancisco for governor". The Daily Gazette. Retrieved May 22, 2018. ^ "Flanagan formally endorses DeFrancisco for governor". February 13, 2018. Retrieved May 22, 2018. ^ a b c Day, Lucas. "DeFrancisco Picks Up 7 Additional Endorsements from Senators". Retrieved May 22, 2018. ^ "Gallivan endorses Syracuse area senator for governor". February 3, 2018. Retrieved May 22, 2018. ^ a b c d e f "Senators Griffo, Larkin, Ortt, Ranzenhofer, and Ritchie Endorse John DeFrancisco for Governor". myemail.constantcontact.com. Retrieved May 22, 2018. ^ a b Reporter, Rick Miller, County. "Young endorses DeFrancisco for GOP governor nod". Retrieved May 22, 2018. ^ a b c d e f g h i j k "DeFran Picks Up More County Chair Endorsements". www.nystateofpolitics.com. Retrieved May 22, 2018. ^ a b c d "Three More GOP County Chairs and the Onondaga County Conservative Party Endorse John DeFrancisco for Governor". myemail.constantcontact.com. Retrieved May 22, 2018. ^ "John DeFrancisco picks up his first endorsement for NY governor". Retrieved May 22, 2018. ^ a b "Staten Island Chair Backs Kolb For Governor". www.nystateofpolitics.com. Retrieved May 22, 2018. ^ Brian Kolb. "Honored to receive the endorsement of @NMalliotakis today. Nicole has fought tirelessly against corruption & mismanagement in New York City and throughout our state. With her backing & the support of voters across NY, we're going to deliver real reform for the people of New York". ^ a b c d e f g h robert.harding@lee.net, Robert Harding. "Finger Lakes GOP county chairs endorse Brian Kolb for governor". Retrieved May 22, 2018. ^ sbuchiere@fltimes.com, STEVE BUCHIERE. "Kolb has another endorsement — and GOP rival". Retrieved May 22, 2018. ^ a b Robert Harding. "INBOX: A second endorsement for Brian Kolb (@kolbfornewyork). He has been endorsed by the Seneca County Republican Committee. So far, he has the support of Seneca (in his Assembly district) and Yates (neighbors his Assembly district). #nygov". ^ "Green Party's Howie Hawkins likely to launch third campaign for NY governor". Retrieved May 22, 2018. ^ Murphy, Jarrett (May 31, 2018). "Video: Green Party Gov Nominee Says 'We Have More Leverage'". CityLimits.org. Retrieved June 20, 2018. ^ "Jia Lee, NYC Teacher / Union activist, announces for Lt. Gov as a Green". www.gp.org. Retrieved May 14, 2018. ^ "Working Families Party endorses Cynthia Nixon". April 14, 2018. ^ "Cuomo cedes WFP line, labor unions pull out of party". Retrieved May 22, 2018. ^ Campbell, Jon; Spector, Joseph (September 13, 2018). "Andrew Cuomo cruises to easy win over Cynthia Nixon in New York gubernatorial primary". USA Today. Retrieved September 15, 2018. ^ "Working Families Party offers ballot line to Cuomo". ^ Vielkind, Jimmy. "Working Families Party Decides to Back Cuomo in Election". ^ Campbell, Jon (October 5, 2018). "Andrew Cuomo accepts Working Families Party nod, clears Cynthia Nixon from ballot". Democrat and Chronicle. Retrieved October 5, 2018. ^ Lovett, Kenneth. "Groups slam Cuomo for headlining Independence Party fund-raiser, getting endorsement on same day - NY Daily News". Retrieved May 22, 2018. ^ "Cuomo's So-Called Women's Party". ^ Lovett, Kenneth. "NYS Reform Party executive committee split over governor candidate - NY Daily News". Retrieved May 22, 2018. ^ Spector, Joseph (December 12, 2017). "Kolb becomes first Republican to officially announce run against Cuomo". Democrat and Chronicle. Retrieved December 15, 2017. ^ a b WHAM. "Rochester native joins the race for governor alongside Larry Sharpe". Retrieved May 22, 2018. ^ "LPNY Surpasses Petitioning Goal of 30,000 Signatures - Libertarian Party of New York". August 20, 2018. ^ Gormley, Michael (September 4, 2018). "Miner, Sharpe survive challenges to get on ballot for governor". Newsday. Retrieved September 4, 2018. ^ "Breaking: Larry Sharpe Running for Governor of New York in 2018". July 13, 2017. Retrieved May 22, 2018. ^ "Larry Sharpe for Governor of New York". ^ "Ex-Syracuse mayor may run for governor as independent". May 31, 2018. ^ Shane Goldmacher (June 18, 2018). "Stephanie Miner to Make Independent Bid to Challenge Cuomo". New York Times. Retrieved June 18, 2018. ^ Roy, Yancey (August 21, 2018). "Stephanie Miner, a Cuomo ally-turned-foe, files petition to run as independent". Newsday. Retrieved September 9, 2018. ^ a b Weiner, Mark (September 5, 2018). "Cuomo allies drop bid to boot Stephanie Miner from governor's ballot". Syracuse.com. Retrieved September 9, 2018. ^ Campbell, Jon (June 25, 2018). "Stephanie Miner picks Pelham mayor, a Republican, as running mate". Gannett News Service. Retrieved June 25, 2018. ^ "Rent Is Too Damn High". Rent Is Too Damn High. Retrieved May 22, 2018. ^ "Election report". www.elections.ny.gov:8080. 2018. ^ "Amended certification" (PDF). www.elections.ny.gov. 2018. ^ "View Disclosure Reports". NYS Board of Elections. Retrieved January 30, 2018. ^ "New York Gubernatorial Debate". C-SPAN.org. ^ League of Women Voters of New York State (November 1, 2018). "League of Women Voters Gubernatorial Debate" – via YouTube. ^ "Joe Biden backs Gov. Cuomo at Democratic convention". Newsday. Retrieved June 8, 2018. ^ FISHER, Kenneth Lovett, Glenn Blain, JANON. "Gov. Cuomo overwhelmingly beats out Cynthia Nixon for Democratic Party nomination". New York Daily News. ^ Seitz-Wald, Alex (May 24, 2018). "Party chief Tom Perez says DNC must keep out of primaries, then intervenes for Cuomo". NBC News. Retrieved May 25, 2018. ^ "NOW Endorses Andrew Cuomo for Governor & Kathy Hochul for Lieutenant Governor - NOW-NYC -". March 15, 2018. Retrieved May 22, 2018. ^ Manchester, Julia (March 20, 2018). "Gillibrand endorses Cuomo for reelection". Retrieved May 22, 2018. ^ "Cuomo receives Schumer's endorsement for third term". ^ "Nancy Pelosi endorses Cuomo for re-election bid". May 1, 2018. Retrieved May 22, 2018. ^ a b c "At Somos Weekend, Cuomo Gets Endorsements". www.nystateofpolitics.com. Retrieved May 22, 2018. ^ "Speaker Johnson Endorses Cuomo For Reelection". June 24, 2018. ^ "Cuomo Kicks Off Endorsement Parade with Healthcare Workers - WNYC - New York Public Radio, Podcasts, Live Streaming Radio, News". Retrieved May 22, 2018. ^ Campaign, Human Rights. "HRC Endorses Gov. Cuomo for Re-Election - Human Rights Campaign". Human Rights Campaign. Retrieved May 22, 2018. ^ "Cuomo Clinches Major Women's Endorsement—Despite Possible Cynthia Nixon Challenge". March 15, 2018. Retrieved May 22, 2018. ^ "Cuomo wins Democratic nomination at convention, Nixon gets 5%". Newsday. Retrieved June 8, 2018. ^ "Cuomo Nets Another Union Nod (Updated)". www.nystateofpolitics.com. Retrieved May 22, 2018. ^ "Planned Parenthood political group endorses Cuomo, Hochul". July 11, 2018. ^ "NYS AFL-CIO Endorses Andrew Cuomo for Governor". July 5, 2018. ^ Lovett, Kenneth. "In a reversal from his past two campaigns, key state union backs Cuomo's reelection - NY Daily News". New York Daily News. ^ "Stonewall Democrats Club Chooses Cuomo Over Nixon". ^ Lovett, Kenneth. "Gov Cuomo backed for reelection by big state union that spurned him four years ago". latimes.com. ^ Fisher, Kenneth Lovett, Janon. "Good government group Citizens Union offers lukewarm endorsement of Gov. Cuomo over Cynthia Nixon - NY Daily News". ^ "Editorial: Choose Cuomo, a friend to Western New York". September 3, 2018. ^ "Opinion - The New York Times Endorses Andrew Cuomo for Governor in Thursday's Primary". ^ Birnbaum, Emily (September 12, 2018). "Nicki Minaj endorses Cuomo for governor". ^ George E. Pataki. "Friends the future of the state we love is at great risk. That is why I am asking all my friends and supporters to please chip in today to help Marc Molinaro to become our next Governor". Facebook. ^ DiStaso, John (October 11, 2018). "NH Primary Source: Sununu headed to New York for Molinaro fundraiser". WMUR. ^ Rick, Karlin (March 1, 2018). "Molinaro gets gubernatorial boost from Chris Gibson". Times Union. ^ "Congressman Peter King". www.facebook.com. ^ Kenmore, Abraham (July 21, 2018). "Molinaro visits St. Lawrence County, receives Stefanik endorsement". Watertown Daily Times. ^ Harding, Robert (May 4, 2018). "Cayuga County state senator endorses Marc Molinaro for NY governor". AuburnPub.com. ^ Harding, Robert (March 13, 2018). "Kolb, NY Assembly Republicans endorse Marc Molinaro for governor". Auburn Citizen. ^ Harding, Robert (May 8, 2018). "Assemblyman Finch endorses Molinaro for NY governor". AuburnPub.com. ^ Lovett, Kenneth (April 23, 2018). "Assemblywoman Nicole Malliotakis backs gubernatorial candidate Marcus Molinaro". New York Daily News. ^ Marc Molinaro. ""Marc Molinaro is a leader who has the experience to move New York forward. As a former Mayor, Assemblyman and County Executive he knows how to lower taxes and create jobs..." I am honored to receive the endorsement of my friend and Oneida County Executive @AJPicenteJr". Twitter. ^ Marc Molinaro. "Thank you, Ann, for your endorsement! I am proud to have an extensive coalition of bi-partisan support. TOGETHER we will win on Tuesday, November 6th. #BelieveAgain #MolinaroForNY #TakeBackOurState". Twitter. ^ "Island Government: GOP lawmakers back Marcus Molinaro for governor". SILive.com. ^ Reisman, Nick (October 29, 2018). "Forbes For Molinaro". NY State of Politics. Retrieved October 29, 2018. ^ Barrabi, Rich. "BREAKING: Nassau #GOP Chairman Joe Mondello endorses @marcmolinaro for Governor. "Marc Molinaro has a proven track record as Dutchess County Executive... He's a young, dynamic candidate who will bring a great deal of energy and enthusiasm to this year's Republican ticket."". Twitter. ^ Eric Ulrich. "Reject the status Cuomo. Vote @marcmolinaro for Governor! #ElectionDay #GetOutAndVote". Twitter. ^ Marc Molinaro. "Proud to have the endorsement of the New York Veteran Police Association! @LouTelano #LEOsBelieve #MolinaroForNY". Twitter. ^ ABC Empire State. "We're proud to endorse @marcmolinaro for Governor of New York. Marc will put politics aside to do what's best for all New Yorkers. It's time for all of us to #BelieveAgain". Twitter. ^ Marc Molinaro. "Yet another great endorsement of our campaign from the Law Enforcement Medal of Honor Committee! #LEOsBelieve #MolinaroForNY". Twitter. ^ a b c d e f g h i j "Day Three Of GOP Chair Endorsements For Molinaro - 570 WSYR". Retrieved May 22, 2018. ^ a b c d e "Marc Molinaro overtakes John DeFrancisco in GOP bid to oppose Cuomo". Retrieved May 22, 2018. ^ Khurshid, Samar. "Molinaro Emerges on Top After Manhattan GOP Gubernatorial Candidate Forum". Retrieved May 22, 2018. ^ "Otsego GOP Endorses Molinaro For Governor". March 15, 2018. Retrieved May 22, 2018. ^ "Endorsement: Molinaro would bring needed change". The Post-Star. October 21, 2018. Retrieved October 21, 2018. ^ "A Voter Guide to the Midterm Elections – Endorsements from the Jewish Voice". Jewish Voice. October 24, 2018. ^ "Our view: Molinaro should be New York's next governor". The Citizen. October 28, 2018. Retrieved October 28, 2018. ^ "Endorsement: Molinaro is New York's future". The Daily Gazette. October 28, 2018. ^ "Vote for reformer Marc Molinaro, not corruptocrat Andrew Cuomo". New York Post. October 28, 2018. Retrieved October 29, 2018. ^ "Molinaro for governor: Voting for GOP candidate will send strong signal to Albany". Watertown Daily Times. November 1, 2018. Retrieved November 1, 2018. ^ "Editorial endorsement: Marc Molinaro for NY governor". The Post-Standard. November 4, 2018. Retrieved November 4, 2018. ^ "Gary Johnson Endorses Larry Sharpe for NY Governor". October 26, 2017. Retrieved October 28, 2017. ^ "Governor Bill Weld Endorses Larry Sharpe for Governor of New York at SFL Conference". TheJackNews. November 6, 2017. Retrieved November 8, 2017. ^ Goodale, Steve (July 17, 2018). "Brooke Harris becomes first elected NY GOP official to endorse Larry Sharpe for governor". News Growl. Retrieved July 17, 2018. ^ Bowden, Craig (February 3, 2018). "ENDORSEMENT – LARRY SHARPE". Retrieved February 3, 2018. ^ "Joseph Byrne". Facebook.com. Retrieved October 4, 2018. ^ "Michelle Darnell". Facebook.com. Retrieved May 22, 2018. ^ "Michael McDermott". Facebook.com. Retrieved October 4, 2018. ^ "Austin Petersen on Twitter". Twitter. Retrieved October 4, 2018. ^ "Stevan Porter on Twitter". Twitter. Retrieved October 4, 2018. ^ "Tosone4Congress on Twitter". Twitter. Retrieved July 17, 2018. ^ Rosenbeck, James (October 31, 2018). "Larry Sharpe can win on election day". The Daily News. Retrieved October 31, 2018. ^ "Wildstar Endorses Larry Sharpe For Governor". September 19, 2017. Retrieved November 8, 2017. ^ "Best of the Program with Larry Sharpe - 10/1/18 - Glenn Beck - Omny.fm". Omny.fm. Retrieved October 4, 2018. ^ "Shannon Joy". Facebook.com. Retrieved July 17, 2018. ^ "Joanne Nosuchinsky on Twitter". ^ "Evan Roberts on Twitter". ^ PowerfulJRE (September 5, 2018). "Joe Rogan Experience #1167 - Larry Sharpe" – via YouTube. ^ The Rubin Report (July 13, 2018). "A Libertarian Running for Governor of New York (Larry Sharpe Full Interview)" – via YouTube. ^ "Bill Schulz on Twitter". ^ Fox News (November 3, 2018). "Gutfeld: Why election stress only damages the left" – via YouTube. ^ Confer, Bob (September 19, 2018). "CONFER: The sharpest candidate for governor". Niagara Gazette. Retrieved September 23, 2018. ^ "Jeremy "Spartacus" Frankel on Twitter". Twitter. Retrieved October 4, 2018. ^ Stossel, John (November 2, 2018). "John Stossel: Libertarian has sharp ideas for NY". Trib Live. Retrieved November 2, 2018. ^ "Matt Welch on Twitter". ^ "Gerald Walker on Twitter". ^ "Aron Price on Twitter". Twitter. Retrieved October 4, 2018. ^ "Matthew Kolken on Twitter". Twitter. Retrieved October 4, 2018. ^ "Dear New York: Elect Larry Sharpe - 71 Republic". 71republic.com. June 3, 2018. Retrieved July 17, 2018. ^ "Libertarian Youth Caucus". www.facebook.com. ^ "Apologies to Our Republican, Libertarian and Independent Supporters". Mailchi.mp. Retrieved July 17, 2018. ^ "Monroe County Libertarian Party". Facebook.com. Retrieved October 4, 2018. ^ Kolstee, Andrew (April 10, 2018). "Onondaga LP Chapter Endorses Candidates, Elects Officers". Libertarian Party of New York. Retrieved April 13, 2018. ^ "OtsegoCountyLibertarians on Twitter". Twitter. Retrieved October 4, 2018. ^ "Dr. Jill Stein🌻 on Twitter". ^ The Jimmy Dore Show (September 18, 2018). "Ocasio-Cortez Endorses Cuomo As Cuomo Flips Off Progressives" – via YouTube. ^ GreenPartyVideos (September 18, 2018). "Jimmy Dore response to Ocasio Cortez endorsing Cuomo, Vote Howie Hawkins" – via YouTube. ^ "Miner for governor". Adirondack Daily Enterprise. October 26, 2018. ^ Breidenbach, Michelle (November 6, 2018). "Howie Hawkins wins enough votes to keep Green Party status in NY". Retrieved November 7, 2018. ^ Breidenbach, Michelle (November 7, 2018). "Stephanie Miner wins ballot line for new Serve America Movement in NY governor race". Retrieved November 7, 2018. ^ "Libertarian Party of New York Achieves Ballot Access". Binghamton Homepage. November 7, 2018. Retrieved November 7, 2018. ^ a_tu (November 16, 2018). "Some third parties see victory in defeat". CSNY.